HOW Did Tourism Authority Employ Minister’s Wife? 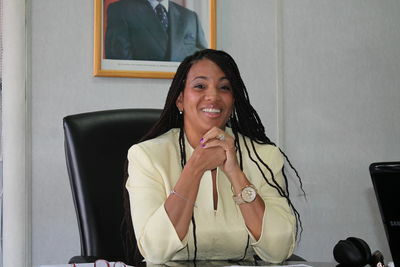 Zimbabwe Tourism Autority chief executive officer, Karikoga Kaseke has had to defend the appointment of Tourism minister Walter Mzembi’s wife, Barbara after the authority was accused of nepotism. Barbara was appointed, as Tourism Zimbabwe patron in 2014, but eyebrows were raised, as some felt the minister may has used his clout to influence her appointment. Kaseke dismissed reports that she had bulldozed her way into the influential position. Speaking at the rebranding of the Miss Carnival to Miss Tourism 2016 at a local hotel in Harare, Kaseke said the authority had invited Barbara in 2014 and she accepted just as Mary Chiwenga, who was invited to spearhead Miss Zimbabwe World. “We invited her. We had agreed with her to be our patron, contrary to all those unfounded reports that she bulldozed her way. We invited her to come and help us and she decided to rebrand it,” he said. In spite of the controversy, Barbara said they realised the Miss Carnival brand had lost its gloss following its association with an inappropriate dress sense. She said Miss Carnival would now be known, as Miss Tourism Zimbabwe and was to be held under the theme Beauty Above and Beyond. “We have noticed that there is a gap between the implications of a carnival and the cultural beliefs in Zimbabwe. The name Miss Carnival did not really represent the goal of the pageant, which is to find a true tourism ambassador for Zimbabwe,” she said.